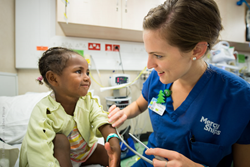 Mercy Ships provides specialized surgeries on board the world's largest private hospital ship. For the second year in a row, Mercy Ships, a global organization committed to providing the world’s impoverished with free, basic healthcare and life-changing medical surgeries, will benefit as charity partner of the American Apparel & Footwear Association. A portion of the proceeds from the [American Image Awards event in New York on May 24 will help support the efforts of Mercy Ships to provide direct patient care and strengthen healthcare systems in Africa. The world’s largest private hospital ship, the Africa Mercy, has been docked in Toamasina, Madagascar, for most of the past two years. In addition to meeting immediate medical needs, Mercy Ships has focused on helping local medical professionals care for patients after the hospital ship departs. Volunteers onboard have provided more than 2800 free specialized surgeries, trained 1791 healthcare workers in capacity-building medical courses and mentored 137 medical professionals. Participants included Malagasy surgeons, nurses, nurse anesthetists and others. For more information about the AAFA Image Awards, please go to: http://www.mercyships.org/americanimageaward. Hi-res photos and general Mercy Ships B-Roll video footage are available upon request.